The basic design of this appliqued and pieced wall quilt and pot holder makes it easy for you to add your special touches. 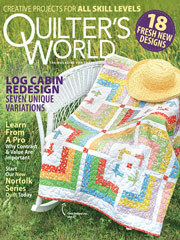 This e-pattern was originally published in the June 2011 issue of Quilter's World magazine. Size: Wall Hanging: 12" x 12". Pot Holder: 7" x 7".